The leaking hose in the video is such an easy thing to fix. New hose end if you’re frugal (Read: Dutch like me), or a new hose. But the water has stained the siding (which isn’t water-proof BTW); How much water has been wasted? Enough to leak into the basement? The other question is: If the simple things haven’t been looked after, what about the big things in the house? The photo shows what happens when the hosebibs and water lines aren’t properly drained in the fall. Water in the tap (especially if the hose is left attached) freezes and expands. This can lead to bursting of components of the plumbing system and subsequently leaks. 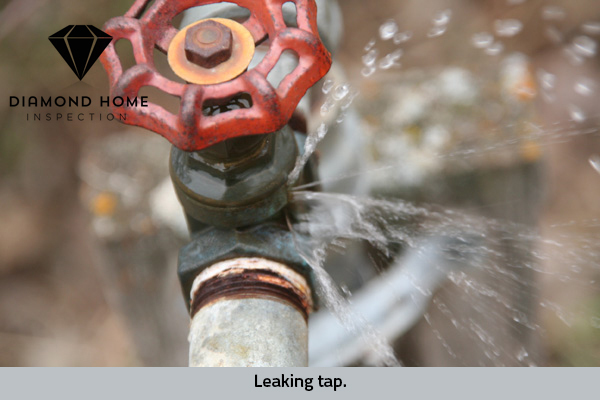 A further complication can be that the pipe bursts just inside the house wall during a cold spell, but doesn’t leak because the ice stops the water…. until it warms up outside and the ice melts. This often occurs when you are away for that spring vacation and then you come back to a flooded basement. I’ve fixed that for people in a previous life. Lets avoid it! When you are buying a house you are buying a job. Let Diamond Home Inspection find out how well the job was done by the present occupants so you can find out how much of a job you might be buying.